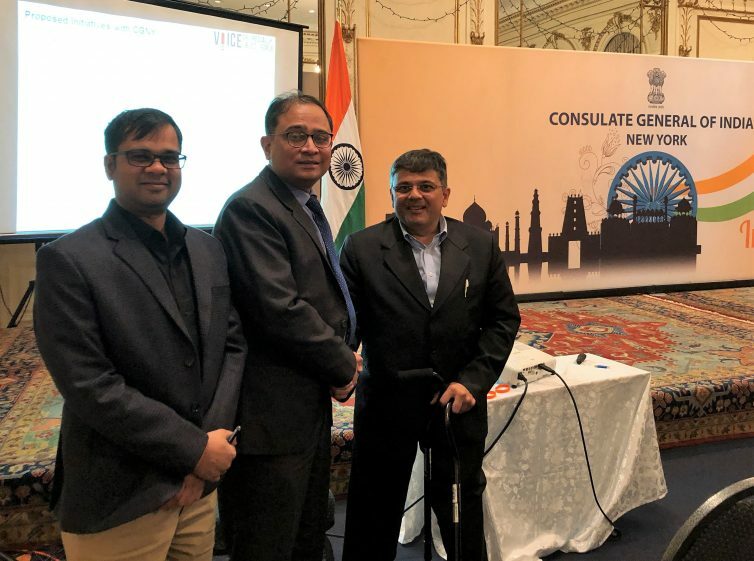 Founder of US based non-profit Voice of Specially Abled People, Pranav Desai met Consulate General of India at New York, Shri Sandeep Chakravorty and Consul Shri Vinod Mesariya. Pranav presented Voice of SAP’s India centric vision, Model, impact and strategies to achieve inclusion and Empowerment of Specially Abled People. He explained how VOSAP mobile app has empowered individuals to perform their ISR (Individual Social Responsibility), create mass movement and generate crowd sourced data on building accessibility. As of now close to 4,000 volunteer pledges have been taken and community of volunteers is growing with help of VOSAP mobile app. He presented VoSAP’s Govt. connect program, Corporate Connect program, Community Connect program and Youth Connect Program and how each of these programs have yielded tremendous impact, change to millions of people’s lives in India. CG took deep interest in this 1 hour long meeting wherein he proposed VoSAP to presented in an upcoming event, organized by CGNY to sensitize all NGOs working in India to include disability related inclusive goals in their charter. Further they agreed to organize a round table conference with invited leaders from NRI community so that VoSAP mission becomes NRI mission where every NRI can be inspired to spread awareness, take volunteer pledge in VOSAP mobile app, adopt a school or place of worship in their native – to be upgraded for accessibility or adopt a Divyang jan in India and many such ways to Empower Specially Abled People (Divyang jan).